Today I found out about the amazing life of Roy Chapman Andrews. From the picture there on the right, you might mistake Andrews for Indiana Jones. 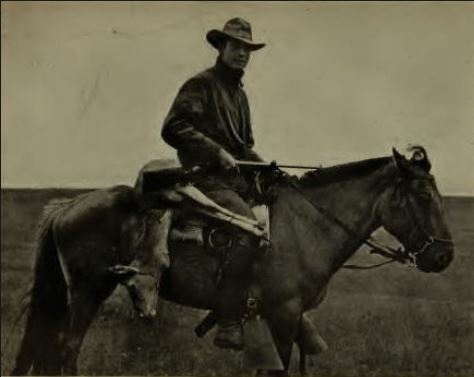 In fact, Roy Chapman Andrews’ life is like something out of an Indiana Jones movie, but without the Nazis. Not surprising, since it has been widely speculated that he was the man who Indiana Jones was based on. (Although, no one associated with the movies has officially confirmed this, and it’s thought by many that the link is indirect, with Andrews providing the model for many portrayals of adventurers in 1940s and 1950s films, which in turn influenced Lucas in his creation of the character of Indiana Jones). He spent his childhood roaming the wilds of Wisconsin, exploring everything from the woods to the waterways. He developed skills as a marksman and as a taxidermist, and used the money he earned from the latter hobby to fund his education at Beloit College. He started off his career at the American Museum of Natural History in New York City… as a janitor. Not exactly glamorous, right? But while he was sweeping the floors of the taxidermy department, he also brought in specimens to display. Over the next few years, he worked his way up in the museum while working toward a Master of Arts degree in mammalogy (the study of mammals). His big break came in 1908 when he was invited by the museum to travel the world studying whales. Andrews jumped at the opportunity. For the next eight years, he could be seen on board various whaling ships. He circled the globe twice while on this particular adventure, particularly being interested in finding beaked whales, but they eluded him in the wild. Funny enough, he found a beaked whale skeleton in the Natural History museum’s collections later, and was able to name it Mesoplodon bowdoini after the man who funded the whale trip. In [my first] fifteen years [of field work] I can remember just ten times when I had really narrow escapes from death. Two were from drowning in typhoons, one was when our boat was charged by a wounded whale, once my wife and I were nearly eaten by wild dogs, once we were in great danger from fanatical lama priests, two were close calls when I fell over cliffs, once was nearly caught by a huge python, and twice I might have been killed by bandits. But it wasn’t whales that made Andrews famous world-wide. It was a trip to the Gobi desert that did that. In 1922, Andrews carried out his first expedition into the harsh Gobi Desert. The main goals were to chart the area and bring back fossils and live creatures, and perhaps prove the museum director’s theory that all life stems from Central Asia. On the expedition, Andrews employed the use of camels and automobiles to trek across the desert—an odd combination, and the use of automobiles in the desert got him called a “fool”, but in the end it worked. Between 1922 and 1930, Andrews and his team went out on five different expeditions into the region. In the Gobi desert, “while his paleontologist used a camel hair brush, Andrews hacked away with a pickaxe.” But his “scientific cowboy” methods worked in this instance; his team found a treasure trove of large and small dinosaur fossils, the skull of an early mammal, and, most significantly, a nest of dinosaur eggs- the first ever found. Previous to the dinosaur egg find, scientists had correctly theorized that dinosaurs hatched from eggs because they were reptiles. However, this was the first time that they had solid proof that this was the case. Because of this, the find was hugely significant in providing knowledge about how the dinosaurs’ life cycles began. In all, the expedition recovered 25 dinosaur eggs and brought them safely back to the museum. Chapman ended up selling one in an auction in order to help fund additional trips. The egg sold for $5000 (about $64.7K today) to one Mr. Colgate, but the auction also helped to accumulate over $50,000 in donations. People wanted to see what other natural history had been hiding in the Gobi desert for centuries. But discovering new species of dinosaurs and dinosaur nests weren’t the only adventures that Andrews and his team had. In one notable instance, Andrews was carefully making his way down a steep, winding road when he saw a group of bandits waiting for him at the bottom of the hill. The bandits were on horseback and wielding rifles. Andrews couldn’t go back up the slope—there was no room to turn around—but letting the bandits take what they wanted was unacceptable, as he’d just come back from a supply run. So what did Andrews do? In true Indiana Jones form, he decided the best course of action was to plough straight through the rifle carrying men at great speed. Not only that, but there was also a scary night when the entire campsite became infested with deadly snakes! It was a family of venomous pit vipers—not exactly the kind of thing you want to see slithering past your tent flap. After someone raised the alarm, the team set to work ridding their campsite of the creatures. They killed 47 in all. As for Andrews, at the end of the evening, he accidentally trod on a long, soft something near his bed, and screamed. It turned out to be a coil of rope rather than a snake. Luckily for the expedition, everyone emerged in the morning unscathed—other than perhaps Andrews’ hurt pride—because the cool temperatures meant the snakes weren’t at the top of their game. Unfortunately, in 1930, the Gobi Desert was closed off to Andrews. The Great Depression made it difficult to raise the funds necessary for such a trip, and the area had recently been overrun by communism, meaning Western visitors were generally unwelcome. That wasn’t the end for Andrews, though. In 1934, he became the Director of the American Museum of Natural History—quite the step up from the janitor he was back in 1906. He also served as the president of the Explorer’s Club in New York from 1931-1934, originally joining in 1908. He retired in 1942, and lived in California until his death in 1960. Great article! I read the whole thing with a John Williams soundtrack playing in my head. Now I have to read the book to found out about the fanatical priests. THANKS FOR THIS INFO. CUD NEVER IMAGINE ALL THOSE INDIANA MOVIES HAD SUM BASIS. THOUGHT THEY WERE FICTION ONLY. REALLY APPRECIATE THE INFOS. U GIVE. TNX. Interesting but I wouldnt say he was the original Indiana Jones – primarily since you have no basis for your claims. It is a known fact that George Lucas took many anthropology/archaeology classes and what was in vogue back then was the adventures of Leonard Wooley and his excavations at UR especially his occasional run ins with nazis looting archaeological sites and art. He also spent a lot of time with TE Lawrence. Students of archaeology will also speak of the various actions of anthropologists and archaeologists before and during WWII – many of whom were spies for the US government (a highly touchy ethical subject in the field of anthropology today). Many of them were students of worked alongside the likes of Arthur Evans, James B Griffin, James A Ford, Philip Phillips, to name a few. I love learning about geologic history and those influential geologists/archeologists such as Roy Chapman Andrews. I believe the dinosaur eggs he found are still on display at my favorite museum (American Museum of Natural History, NYC). I first heard about Andrews while in Dr. Bennington’s geology class at Hofstra University. I was so inspired by Dr. Bennington because he made Earth’s science history come alive and easy to understand. A year after my first geology class I did a study abroad with Dr. Bennington to the Galápagos Islands. I believe my daughter, Rebecca LaBarca, is correct that George Lucas got the idea for Indiana Jones based on Roy Chapman Andrews (hat and all)!